Have you ever seen a band perform live so beautifully that you wished you could lock them up in your pocket to take them with you to have them available to play on command performances? That's exactly what the British band Minibar is like. Largo, one of the most intimate nightclubs in Los Angeles was the place to be last Tuesday night. With their recently released debut record, Road Movies, Minibar took the stage of the packed club to deliver an impressive and flawless set. Headed by lead singer Simon Petty, this quartet played most of the tracks from their album, mesmorizing the crowd with their fluid melodic tracks. Songs like the title track, "Road Movies" that explains the yearning these gentelmen felt to move to the idealistic California. No band before Minibar has sung the word "California" with such yearning and passion that it is almost ethereal. Wiith three part backing harmonies, pedal steel guitar (played by Tim Walker) and an influence of mostly American rock with a wee-bit of the short British pop structure. 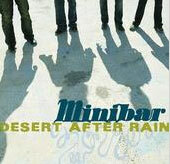 Minibar exhibited passion and love for their music in their hour long set. It seemed as though that hour passed in a bllink of an eye because it was filled to the brim with rich and complex tunes. Crediting Wilco and Neil Young as influences, their velvety sound and wry and clever lyrics (which they all contribute to) add up to sheer perfection. Minibar is one of the best newly signed bands to hit the scene. See them once, and you'll be hooked for life. Minibar performs at the Silverlake Lounge Monday April 23--21+. Make sure to check them out, as it's time well spent. To listen to songs from Road Movies go to www.minibar.uk.com.